Terrible noticia la que acabamos de recibir. Daevid Allen (Soft Machine, Gong) deja de luchar contra el cáncer del que recientemente le han operado. Le han comunicado que su cáncer de cuello se ha extendido al pulmón y es inoperable. Ciertamente es un duro golpe para los que hemos seguido la trayectoria de este genio. OK so I have had my PET-CAT scans (which is essentially a full body viewing gallery for cancer specialists, ) and so it is now confirmed that the invading cancer has returned to successfully establish dominant residency in my neck. The original surgery took much of it out, but the cancer has now recreated itself with renewed vigour while also spreading to my lung. I am a great believer in “The Will of the Way Things Are” and I also believe that the time has come to stop resisting and denying and to surrender to the way it is. So Thank you SO much for being there with me, for the Ocean of Love and Now, importantly, Thank you for starting the process of letting go of me, of mourning then transforming and celebrating this death coming up – this is how you can contribute, this would be a great gift from those emotionally and spiritually involved with me. Nacido en 1938, este australiano se unió en los años sesenta con Robert Wyatt, Kevin Ayers y Mike Ratledge para fundar Soft Machine, pero fue poco más tarde que, en un viaje a Francia cuando conoció a sus futuros compañeros con los que formaría una banda totalmente imprescindible para todo aficionado al rock progresivo, Gong. 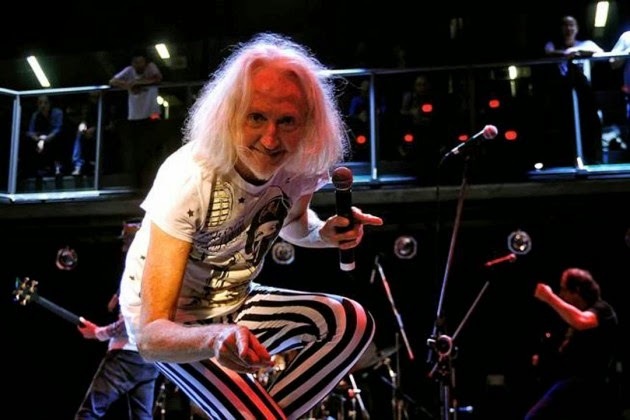 Sin duda, esa fue la mejor etapa de Daevid Allen.